Wow, what a name this TaylorMade Spider putter has. I’ll refer to it below as the TaylorMade Spider Diamond for short in our review today. It’s also called the Spider Tour Platinum but we think Spider Diamond sounds fancy. It’s one of the best putters on the market if you’re thinking of exchanging or upgrading your putter this year. 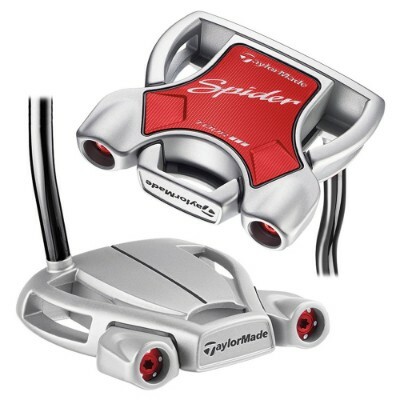 There are multiple models of the TaylorMade Spider. We have the original Spider putter, the Spider Red Putter, Spider X Putter (navy blue & gold options), and today’s review of the Spider Diamond Putter. As we dive into the technology, specs, feel, sound of the Spider Diamond putter, you’ll notice these links throughout the text saying “resource” and I encourage you to pause and check out my golf practice plans for improving your time spent on the course. Working on your game in practice will help your scores more than buying new golf clubs and equipment! So tryout one of my several practices for lowering your score. Most important when selecting a putter is picking one that gives you control and is easy to keep on line during the putting stroke. At impact the face needs to be square to start the golf ball on line. Any twisting or turning of the face during the putting stroke can throw off your putt and result in more misses. With the TaylorMade Spider Diamond, you are getting a high MOI putter which helps you keep the putter face square to the path. Feel in the hands is also important to know if the putt was stroked pure as butter or mishit on the heel or toe. The TaylorMade Spider Diamond has a vibration dampening PU foam that was inserted between the body of the putter and the putter’s frame to help increase your feel and enhance the sound the putter makes at impact. The body or core of the Spider Diamond putter is a lightweight aluminum and the exterior frame is stainless steel. The face has an Ionomer Pure Roll insert placed at a 45A angle and this is designed to increase your forward roll on putts to reduce skidding. It also helps you dial in distance control by having better consistency of roll off the face. The single alignment line running down the middle helps you center the ball easily at address and square up your putter to the line you read on the green for break. A double bending neck for the hosel shaft, promotes a face balanced putter design. Other putter options often have shaft slant to create toe hang which produces more arc in the putter stroke path. Head weight is 355 grams with weight in the center section as well as in the “speed pods” you see hanging off the back outside edges of the putter. The contrasting color scheme is also very sharp and professional making this putter visually attractive and fun to use. It’s considered a mallet putter with it’s square head design and you can learn all about mallet putters in this resource guide article. Lastly, let’s talk putter grip. The standard grip that comes on the Spider Tour Platinum is the SuperStroke Pistol GT 2.0. However, you get a choice in the putter grip that comes on the Spider Tour Platinum if you want to customize it. There is the Winn Medalist Pistol which comes standard on the red model or there is the Winn AVS Mid Sized Pistol on the Black model. Thanks for reading our review of the TaylorMade Spider Tour Platinum (Diamond) and make sure to check out our resources below that golfer’s love following to improve their scores quicker. We’ve helped thousands of golfers and look forward to helping you too!